The University of Toledo football team will begin its quest for a 2016 Mid-American Conference Championship when spring practice opens Tuesday, March 1. The Rockets will have three practices this week, then take a week off for spring break before resuming practice Tuesday, March 15. Junior running back Kareem Hunt, who ran for two touchdowns and 79 yards in Toledo’s 32-17 win over Temple in the Marmot Boca Raton Bowl, and the Rockets return to the field to practice this week. 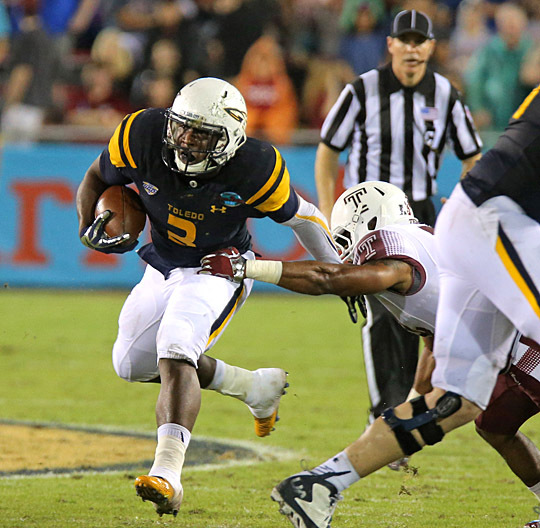 Toledo is coming off a 10-2 season, including a 32-17 victory over Temple in the Marmot Boca Raton Bowl. First-year Head Coach Jason Candle returns 15 starters from last year’s squad, including junior running back Kareem Hunt, a first-team All-MAC selection in 2014. “The quality of players we have is as good as it’s been since I’ve been here. But we know ability doesn’t always equal wins. It’s all the other characteristics that often make up a winning football team,” Candle said. “The players who are returning learned so many lessons last year, not only how to play the game, but they learned how to overcome adversity and never quit. The spring practice season will culminate with the annual spring game in the Glass Bowl Saturday, April 9, at noon. Rocket football season ticket orders are being taken now. Call 419.530.GOLD (4653) for more information. This entry was posted on Monday, February 29th, 2016 at 1:01 am and is filed under Athletics, Events .